Some people color inside the lines. Others paint like Picasso. Some people color-coordinate their closet. Others pull clothes from heaps. Some people revel in creating order. Others take joy in destroying it. I confess I am the former, even in the case of the color-coordinated closet (it’s like a rainbow of polos…am I the only one who thinks that’s awesome and helpful? Probably.). Anyways, my need for order, structure, and balance has led me to structure my savings accounts in a very specific way. Maybe you’ll find it helpful. Maybe you’ll think it’s weird as my closet. I was having trouble keeping track of saving for multiple things that are relatively short-term in nature. For our family, there are two major categories we’re save up for right now – a vehicle and home improvement projects. In the past we saw the same issue with graduate classes and travel expenses. These items are hard to fit into a monthly category, but we intentionally stock away money each month for each. I usually like setting up automated transfers so my budget on Mint.com catches it, but I didn’t want to deal with multiple banks or multiple accounts for multiple savings goals. That’s like having cheese and eggs and vegetables all on the same refrigerator shelf…unheard of! Plus, we often take on little home improvement projects, but the money doesn’t come directly out of the savings account when we spend it. On top of all of that, it was ruffling my feathers that the dollar amount we were saving wasn’t represented by any account balance that I could see. That’s like seeing a picture frame just a tad off level. Ugh! I finally found a workflow that allows me to tie these loose ends together. I make a savings transfer at the beginning of the amount, let Mint.com track when I spend money away from this savings amount, then make a transfer to restore order at the end of the month. Here are the numbers I worked with for the month of June. In June, we took multiple visits and bought some home improvement items from Menards that totaled about $100. Therefore, manually transfer $100 on June 28 from savings to checking. I keep track of the running totals in a simple ledger like the one below..
I’ve appreciated a couple things about this framework. Confidence. When I devote myself to saving money, I want to make sure it’s actually happening. If saving up for purchases is entirely done within the same checking account, it’s hard to tell with a fluctuating balance on the progress. Accountability. I’ve found that this process is automated enough with the automatic transfer at the beginning of the month to ensure we reach our goals. Flexility. 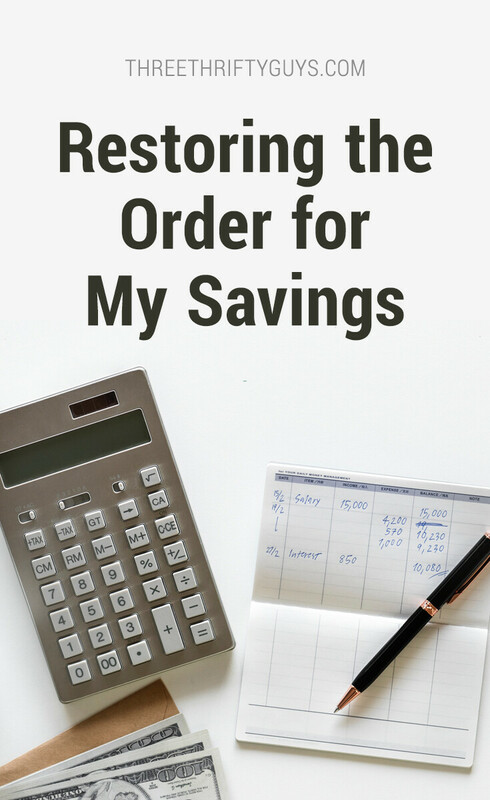 Because some savings amounts are more fluid than others, the end-of-month “restore the order” transfer can adjust a real account balance to reflect what happened. Order. Finally, I can check that the balance I see on the computer screen is matching my simple ledger. It’s like seeing the last shirt go up on the hanger. Satisfaction! Not everyone is as obnoxiously obsessive about order as I am, so what about you? Do you see a need to track different savings endeavors? If so, how do you manage to do this efficiently? Karen- I saw your post and we have many things in common. I thought I’d respond. I know that being self-employed is ideal in the sense that your hours are flexible since you design your schedule. With the prices of health insurance, however, finding a job that offers part-timers benefits would be cheaper than buying a policy online. There are jobs out there that still offer part-timers benefits. I have such a job. The online health ins websites give you total cost and premium prices based on the info you submit. You may or may not get a subsidy, depending on your income. Play around with it. Thanks for the article! I really enjoyed it. You are not alone, I do the color co-ordinated closet thing too. I have also tried to do something similar with my saving. And, like you, I have found it difficult to track everything I want to save for when it’s all piled into one big savings account. So, you have inspired me to have the confidence to fine tune my finances for my savings and be more organized. Thank you so much for sharing, I am grateful! I am also a young at heart, healthy, 60 year old single female, that went back to school full time to become a massage therapist. After my divorce, I bought my house and paid cash for it (thinking I would be smart just in case I lost my job, I would have a place to live, mortgage free). I ended up losing my job 5 months later. Which was ok…a very toxic workplace and I was contemplating leaving that job anyway. But, I can’t get a loan, (which may be a good thing! ), because my house is paid for and I have such a low income, so I struggle…but pray with the intention of financial abundance and as the law of attraction has proven to me: that opportunities have manifested for me to increase my work hours at my one part time job. Last year my income was only $6,000, since I went back to school full-time; so I was on food stamps and medicaid. As of January of this year, I got my massage license, but don’t want to work at a spa, I want to be my own boss (you’ve heard of “mean girls”, yes, it even happens when you are 60!) I want to help people get healthy, take my time with massage clients and help people heal. So, building a clientele is a little slow. Luckily, I am able to conservatively withdraw on my IRA now, work my part-time job for $10.25/hr. and have a handful of clients at $60/hour. But I also have 2 school loans now and a new rescue puppy that has a lot of medical bills. Life! :) . And now, I am off medicaid and have to hunt for health insurance. My quandary now is…if I take out more money from my monthly IRA, (to help pay down bills and for home improvement), it increases my income, which in turn, I’m guessing will increase my health insurance, in a way, it seems like a losing battle. Any suggestions? Again, I am grateful for your insight on organizing my savings as I am trying to live a minimalist lifestyle.